Before Meghan Markle became the Duchess of Sussex, there was a great amount of speculation – as there remains – about what brands she would turn to to build her royal wardrobe and how she would use her powerful fashion force to showcase more British brands than she may have in the past as she joined the British Royal Family. Meghan often looks to the same brands for repeat wears for engagements, and with the new collection that has just been released by DeMellier, there are many bags in their collection we can see Meghan turning to. Bags like…. While Meghan loves a good clutch, there will soon be a small person in her life she’ll need to start carrying around a few essentials for – and as we saw when she landed in Australia, she now has documents and other requirements to carry with her. A great tote bag sized handbag like the ‘Barcelona’, especially with its exterior zippered pockets, would be perfect for Meghan’s coming engagements both personally and professionally. She can fit both official documents as well as extras such as a baby kit thanks to the multiple internal compartments. For public events, we largely see Meghan carrying clutches or crossbody bags. We think that the simple sophistication of the ‘Athens’ clutch would be perfect for future Meghan royal engagements. We love the wide variety of colours & textures that the bag is available in… AND you can get your initial in solid brass attached to it, as well as monogramming the strap. Another great option for Meghan (hint, hint, KP!) would be the ‘Oslo’ cross-body bag as we know she often loves to wear cross-body bags to have her hands free during official engagements. The mixture of textures on the bag add some visual interest which make the bag pop and we could see this being a great way to fly the British fashion brand while also sticking true to her minimalist fashion sense. 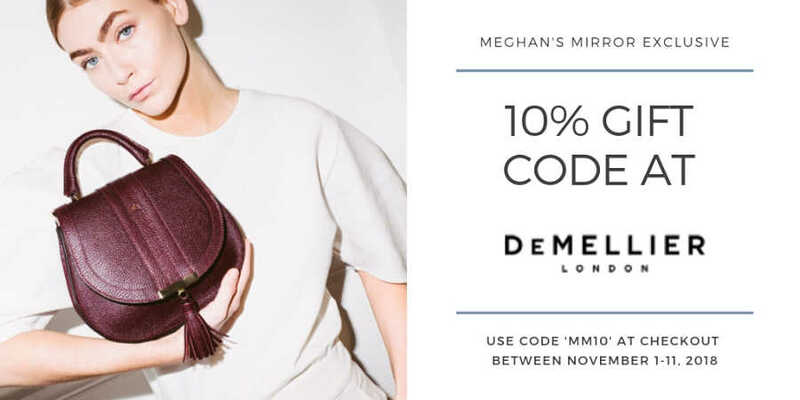 DeMellier has graciously offered Meghan’s Mirror readers an exclusive chance to pick up one of their gorgeous new season fall bags – or Meghan’s Mini Venice in forest green – for 10% off the purchase price. DeMellier has graciously offered Meghan’s Mirror readers an exclusive 10% gift code to use across their fall collection – including Meghan’s Mini Venice in forest green. At checkout, use code ‘MM10‘ to get 10% off from November 1st through November 11th. It’s the perfect way to add a new bag to your collection – or leave a hint for someone about what you might want to see under the tree this holiday season? I purchased one of their Manhattan bags in Blush Grain and I absolutely love it. Worth every penny, ladies! Thanks for the feedback, Steph! I ought the mini Venice in forest green after seeing Meghan with hers. It is a lovely bag, great quality and a good size. Now pondering getting it in another colour! I have the Manhattan in black and the Sienna in plum suede. I did discover the brand through Meghan. That said I wouldn’t buy anything she’s worn but I have discovered some great brands I’ve never heard of from her having sported them.